Spring is coming and it’s the perfect time to visit an arboretum and celebrate the end of winter. Unless you have terrible allergies, in which case you’re better off staying inside your hermetically sealed house and playing a game about creating and visiting (you guessed it) an arboretum. Which brings us to Arboretum, a new game from Z-Man Games that gives you a little taste of spring in a box – and it’s pollen free! 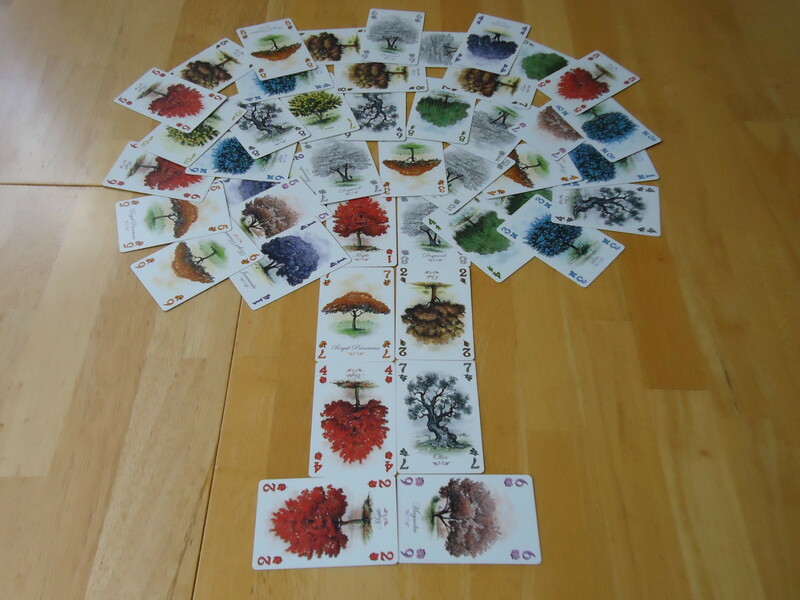 Arboretum is a card game in which you are trying to build the most aesthetically pleasing arboretum. Your job is to to choose which trees to feature in your arboretum and then arrange them into paths so that your visitors can properly appreciate the beauty you’ve created. At the beginning of the game, each player is dealt a starting hand of seven cards and one additional card, face-up, which begins that player’s discard pile. The remaining cards are placed face down on the table to form a draw pile. Draw two cards. You may draw cards from the draw pile, or you may take the top card from any player’s discard pile (including your own). You may split your draw amongst any of the piles, or draw from the same pile. Play one card from your hand into your arboretum. On your first turn, play any card face-up in front of you. On subsequent turns, you must play cards adjacent (horizontally or vertically, never diagonally) to previously placed cards. Once placed, cards cannot be moved, removed, or covered by other cards. Discard a card from your hand face-up onto your discard pile. The game ends when the draw pile is empty. The player who drew the last card plays their turn and then scoring begins. Paths of trees are what score you points, but you must win the right to score your paths over other players. 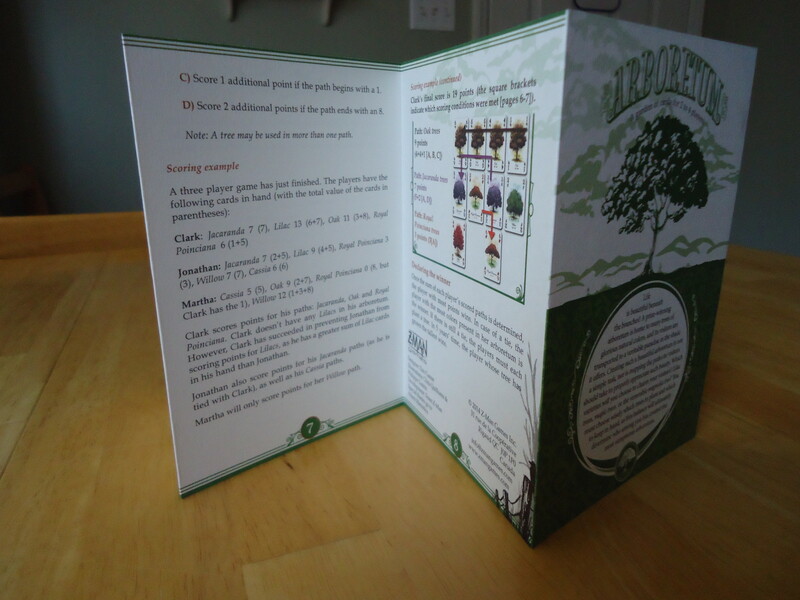 The dealer reads the name of each tree (which corresponds to a card color). For each color/tree, the player who has the highest sum for that color in their hand wins the right to score their path matching that color. (Exception: If a player has the 8 of a color in their hand and another player has the 1 of that color, the value of the 8 is reduced to zero.) If there is a tie, all tied players gain the right to score their path of that color. When you score a color, you find a path through your cards that begins and ends with that color (the cards in between don’t necessarily have to match), and each card along the path must have a value greater than the preceding card. For example, a path made up of 2, 5, 7, 8 is a legal path assuming the 2 and 8 are both of the color being scored. These paths are not required to travel in a straight line, although you can’t travel diagonally to create a path. You may win the right to score a path color that is not present in your arboretum. In this case, you’ve simply denied everyone else the right to score that path and no one gets points for that color. Score one point for each card in the path. Score one additional point for each card in the path if the path consists of at least four cards and they are all the same color. Score one additional point if the path begins with a 1. Score two additional points if the path ends with 8. The player with the most points wins. If there is a tie, the player with the most colors in their arboretum is the winner. If there is still a tie, each tied player must plant a tree. The player whose tree is tallest after five years is declared the winner. Can You See The Forest, Or Just The Trees? 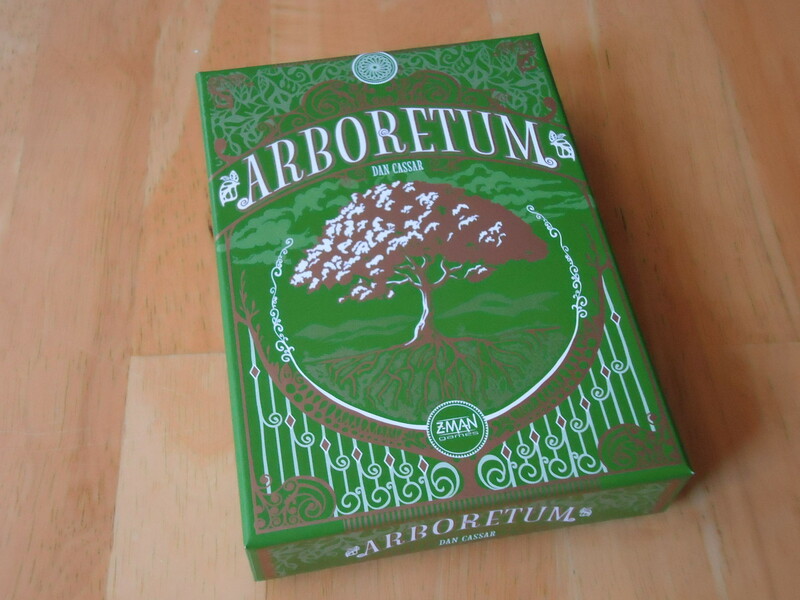 When you open the box, Arboretum looks like every other card game. There’s nothing in the box except a deck of cards and a rule book, which is really more of a pamphlet. There aren’t even any tokens. It looks dead simple and, except for the pretty artwork, kind of boring. But this is definitely a case of, “looks can be deceiving.” There is a lot going on in that little box. This is a highly strategic, addictive little game with some innovative ideas at work. You’re not just trying to collect cards of a specific color, or string together the most cards, as in many card games. Sure, you may want to do those things, but you also have to remember that your right to score whatever you’ve built isn’t guaranteed unless you can win that right. So you not only have to win the game of building the best paths, you also have to win the game-within-a-game of keeping back enough points to be able to score your creation. Very tricky business, indeed. As the game progresses you have to ask yourself: Do I want to go for a path of just one color, or do I want to try to string together as many cards as I can? Do I want to start with a “1” and try to end with an “8?” There are bonuses to be had for each of these ways of creating paths, but they each come with the possibility of ruin. Going for a specific color can you earn you the most points, but it can cost you if you play all the cards of that color in your hand and have none left to put down to win the right to score that path. If you try to string together a long path to gain lots of points, you may have to do that to the exclusion of almost everything else. If you try to begin with a one and/or end with an eight, you may hurt yourself come scoring time if you can’t defend against an opponent who has the one or the eight of the suit you’re trying to score. Just playing cards and building an arboretum with this scoring system would be hard enough, but it gets worse because you have to discard a card at the end of your turn and someone else can take it! So you have to balance what you play to your arboretum against what you’re keeping in your hand to win the right to score your path, all while watching what your opponents are doing so you don’t discard a card that will enable them to score big. That means that there is a lot going on in this little game. You’re likely managing multiple paths in your own arboretum, watching what you’re holding in your hand, keeping track of what your opponents are building, and watching the discard piles. The more players you have in the game, the more there is to keep up with because there are more tableaus and discard piles. It’s tense, exciting, and a puzzly brain burner. It’s a bad pun, but it really is a case of “seeing the forest for the trees.” If you’re focusing only on your trees/cards and missing everything else that’s going on in the game, you’re missing all the fun and you’re probably not going to win. As you go along, you realize that all information is known in this game, if you’re paying attention. You can see what each player has discarded, so you can estimate what’s left in the draw pile. Since the game is played until the draw pile is empty, near the end of the game you can guess your odds of someone having the “1” of your suit and blowing your scoring chances if you have the “8.” If that “1” isn’t in any of the discard piles, you don’t have it in hand, and there are only three cards left in the draw pile, your odds are pretty good that someone else has it and is going to mess you up. You might get lucky, but probably not. Stealth education: The score sheets teach you the proper names for the trees. You can also begin to estimate your chances of getting any card that you need once you see what your opponents are building and discarding. If no one else is going for blue, you have better odds than if someone else is also going for blue, for example. Depending on how things are going, you may want to abandon your plan and go with another plan. Or not, and just hope the cards fall in your favor. These are just a few of the things you have to think about every turn. Arboretum plays great at all player counts, although I think it is a bit more of a brain burner with just two players. Since you’re able to give all of your attention to a single opponent, it plays much more like a puzzle that you have to solve. With more players it’s still challenging and strategic, but it’s also inevitable that something will slip by your attention and you’ll find yourself trying to correct your mistakes or develop a new plan on the fly. The game generally moves pretty fast, although you might run into some AP-related slowdown if you’re playing with AP prone players. There aren’t that many options since you’re limited to just three actions on your turn. However, the decisions you can make take a minute to think through and AP prone people won’t want to lay a card down until they’ve thought through every permutation of their draw, play, and discard actions. It seemed strange at first, but we found that people spent more time deciding which cards to take from the discard/draw piles rather than playing their cards. This makes sense, though. When you’re drawing your cards, you’re trying to get cards that will help you, but also cards that might deny your opponents what they need. Do you grab things that will only help you (or take a blind draw if nothing visible will help you), do you deny try to deny your opponents by taking cards you know they need, or do you split the difference and go for one card that helps you and one that hurts an opponent? If there are more than two players, this decision gets a bit more difficult because you might have the opportunity to hurt two opponents with your draw. Do you do it or not? Once you’ve decided what to take, the decisions about what to play and what to discard seem to come much quicker. Finally, I just have to say that I get a kick out of the second method of settling ties in this game. The tied players must each plant a tree and come back and measure it in five years. Whoever’s tree is tallest then is declared the winner. I realize that they don’t seriously expect people to do this (although it would be fun to try), but it’s unique and funny to find this in a rule book. And it’s much more thematic than flipping a coin. You just have to hope that you’re still friends with your fellow players in five years and still living close enough to each other (and the trees) to make this possible. Arboretum is great for almost any group. The tree theme is neutral, which should be attractive to non-gamers and gamers who don’t care for fantasy or medieval themes. The rules are so simple that casual card players will have no trouble picking this up and playing. It’s fast enough to be a filler, but challenging and addictive enough that multiple matches could fill an entire evening. 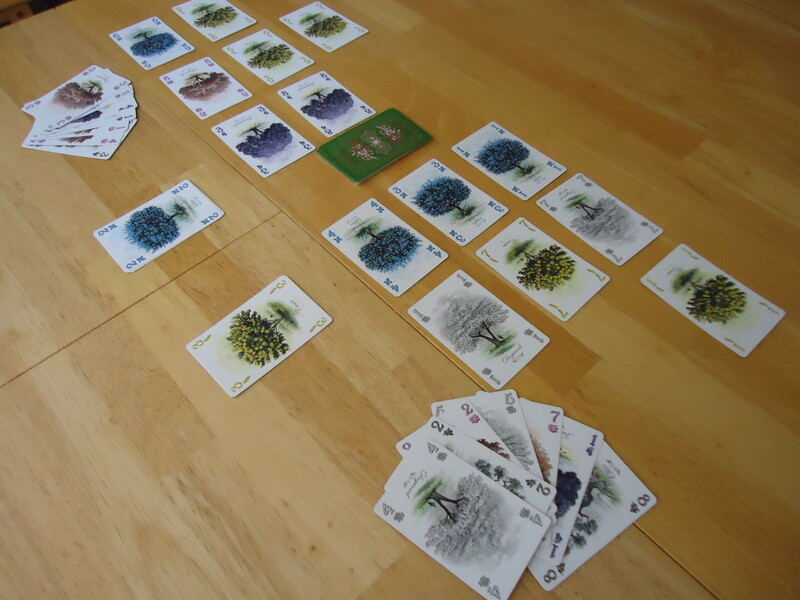 For such a small, easy to learn, quick playing game, Arboretum delivers quite a bit of bang and I really enjoyed it. When I first looked at it I didn’t think it would be anything special, but as we played it and I realized that building a path was only half (maybe only a third, actually) of the game, I really grew to love it. Having to build a high scoring path while also keeping enough points in hand to actually be able to count your path’s score is innovative and adds another level of thought to what appears to be a simple game. Add to that the fact that you also want to actively deny your opponents the right to score, if you can, and you have a very intriguing, strategic, addictive game that’s perfect for almost any group. iSlaytheDragon would like to thank Z-Man games for giving us a review copy of Arboretum. Highly portable, small box game. Easy to learn, quick playing game is great as a filler or for multiple games in a row. Lots of ways to create paths that will score points. Interesting tension in the mechanics of playing, drawing, and keeping cards in hand. Puzzle-like game play is addictive. $20 (MSRP) is a little steep for what you get. While not a hugely AP-prone game, serious thinkers can slow things down. Fantastic review! 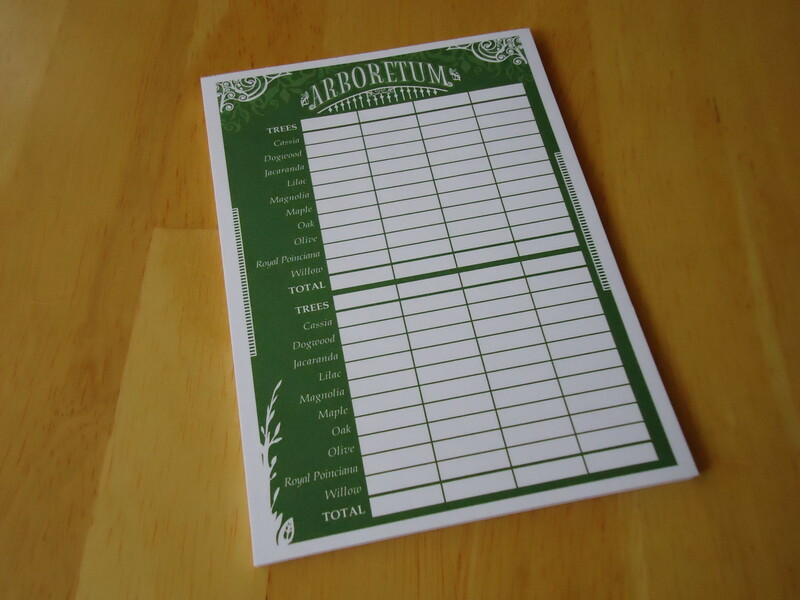 Arboretum just became my favourite card game, it’s so simple but with tough decisions. Fortunately the guys I have played with haven’t suffered from A-P but I can see that happening easily. Another great one that I liked too is Lords of Scotland, from Z-Man too.